They will help your baby chew the food for easier digestion. They can facilitate good word articulation when your baby starts to speak. They hold a location in your baby’s jaw, which will further be the placement for their permanent teeth. They help in maintaining the shape of the face. Knowing that they are important to the baby’s well-being, it is not unusual for parents to start worrying if they do not see their baby’s first tooth on the age it is expected to come out. 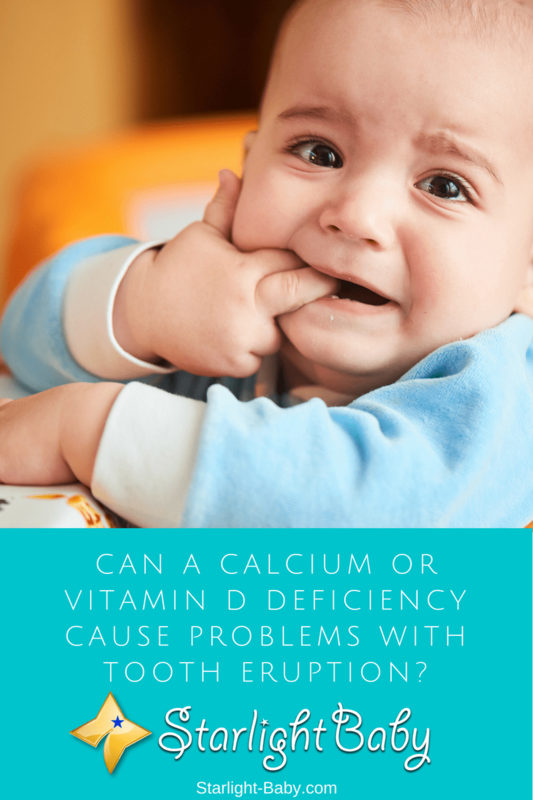 Along with this are some puzzling questions one of which is – is there any link between a delayed tooth eruption and a vitamin D or Calcium deficiency? Before we can answer this question, let’s have an overview of the roles played by Vitamin D and Calcium inside our body. Vitamin D And Calcium: What’s Happening Inside? The vitamins and minerals that our body takes or produces have specific functions to perform towards the goal of maintaining a homeostatic or well-balanced environment inside our body. If one is lacking or insufficient, there will be ill effects to our body’s well-being. You may have heard of Vitamin D being referred to as the “sunshine vitamin”. This term became popular because of the vital role that sunlight plays in the production of this vitamin. The skin serves as the primary source of Vitamin D, but it will need the activation of the sunlight to produce certain amounts. We can also get Vitamin D from various food sources such as animal liver and fish oil, or from oral supplements and fortified products. However, this “raw” type of Vitamin D isn’t that useful to the body as yet, and it works more as a supply of “precursor” which is needed by the body for future use. When our body is alarmed due to low levels of Calcium, it will signal the liver and kidneys to convert the Vitamin D precursor into its active form called “calcitriol”. Calcitriol will then signal the intestines to absorb more Calcium from the dietary sources. Without this active form of Vitamin D, the intestines can’t squeeze out calcium no matter how much you ingest Calcium-rich foods and supplements. Since Calcium is pretty much needed for a variety of muscular and neural functions, our body would need to get it from another source like our bones, and this will result to a process called “bone resorption”. Bone resorption involves breaking down the bone surface to release calcium into the blood. Overdoing this process to meet continued high demands in Calcium would result to a significant decrease in bone mass, which can further result to debilitating conditions like rickets (in children) and osteomalacia (in adults). Delayed Teeth Eruption And Vitamin D Or Calcium Deficiency: Is There Any Link? The American Pediatrics Association suggests that children who still have no teeth by the age of 18 months should be taken to a dental check-up. Why should this delayed tooth eruption be a concern? It will affect the way kids eat their meals. It may slow down the digestion of nutrients from food. It will increase the risk of dental problems later on. It may signify other serious underlying causes like hypopituitarism, Down’s syndrome and Rickets (caused by a Vitamin D deficiency). So let’s focus on the role of Vitamin D and Calcium in the teeth of young children. According to Merriam-Webster dictionary, a tooth is defined as a hard, bony appendage of the jaws. Since it is an extension of the bone, the teeth is also of similar chemical composition, mainly of calcium, magnesium and phosphorus. It can also be affected by certain conditions that affect the bones and among them are Vitamin D and Calcium deficiency. If young children have one or more of these manifestations, doctors often suggest watching out for a condition called rickets. Rickets is characterized by soft, brittle bones which further result to bone deformities like “bowed legs” and arched chest. The oral manifestations mentioned earlier are also evident. These deviations in the normal teething process make children more susceptible to dental problems like pulp infection and gum abscess. Overall, a delay in the pattern of normal teething isn’t something big to worry about. However, if a child reaches a certain age (18 months) without having a single tooth, then parents may need to bring him to a dentist or physician to evaluate the case if it is related to conditions like Vitamin D or Calcium deficiency.